The car pulled up outside the airport - the airport all five of them had visited perhaps too often - indicating that it was time for them to get out. The five boys stayed silent as they grabbed their suitcases from the boot and wheeled them through the sliding doors to the check in. The hired assistant was a few paces ahead of them - a man who they had never met before (they were different each time, for some reason), who never smiled, never spoke to them directly, but seemed to know what he was doing and where he was going, whereas the five boys did not. No matter how many times they entered the massive airport, they would always somehow end up lost. The assistant spoke in a low voice to one of the secretaries behind a desk, who abruptly sat up and glanced over the tall man&apos;s shoulders to where SHINee were standing awkwardly, unsure what to do with themselves. Onew was the only one who seemed comfortable with the situation. He walked up to stand beside the assistant, speaking to the secretary with a friendly smile. Soon, the five of them had had their passports checked and were passing through security. And still, no one was talking except Onew, who was rambling on about how much fun he was going to have in London. None of them seemed interested, and soon Onew trailed off, leaving them walking through the airport in silence. "You have another hour until the plane leaves," the assistant said as they gathered into the shopping centre. "Meet back here for 12PM, no later. If you run into any trouble, you have my number." He nodded once before disappearing into the crowd. Thankfully, the airport wasn&apos;t as busy as usual, and many of the people walking around were business men. Jonghyun and Key soon walked off out of view, and Onew left in the direction of the food stalls. Minho glanced over at Taemin who was staring at his shoes and fiddling with the tag on his suitcase. "Do you want to go and get some lunch?" Minho suggested, stuffing his hands in his pockets, his own suitcase resting against his leg. Taemin just nodded, still not looking up. "That&apos;d be nice." They left in the opposite direction of Onew, and eventually found a decent looking restaurant on the second floor that served a bit of everything. Thankfully, there was a free table near the back that seemed almost isolated from the rest of the restaurant which was only half full, and only with business men that looked bored and completely uninterested in them. The waitress brought them around to the back, handing them menus as they sat down. "Can I get you anything?" "Just a glass of water, please," Taemin said quietly, feeling the waitress&apos; eyes on him. Minho nodded, asking for the same. She obviously recognised them, but was trying to contain her excitement, knowing that it would only be unprofessional. Minho saw her smiling to herself as she wandered off the bar on the other side of the room. "Do you want to talk about it?" Minho asked after a moments silence. Taemin shook his head, and when he didn&apos;t say anything in reply, Minho could only say: "We&apos;re going to have to talk about it eventually." "It can be avoided for now, though," Taemin whispered. Minho noticed how awfully quiet Taemin had been since the photos had been leaked. Usually he was always so hyperactive and happy, but now he just seemed drained and unmotivated to even get out of bed. It had taken Minho thirty minutes to convince him to get out of bed that morning. "Please talk to me," Minho said, reaching out for Taemin&apos;s hand though he moved his hand away from the table so that he couldn&apos;t hold it. Minho felt hurt: there was no reason for him to act like this, yet he was anyway. "Taemin..."
Taemin just shook his head: "Not now." But the waitress was already back, smirking and holding two glasses of water. "And what would you like to eat?" "We&apos;re going to have to head back soon," Jonghyun said as Key was browsing through the makeup products. Key had already picked out three different face creams and was now looking at the expensive makeup brushes. "Don&apos;t spend loads of money now - you&apos;ll have none left for London," he laughed, grabbing Key&apos;s arm and trying to pull him away. "Yahh! Let go, I&apos;m not spending that much." "That&apos;s at least 50000 won right there!" Jonghyun exclaimed, taking two of the creams out of his boyfriend&apos;s hands and placing them back on the shelf. "No, I want that one! I&apos;ll put the rest back," Key said, swapping one of the bottles and then walking back over the the cashier with his head held high. Jonghyun only laughed and trailed along behind him. He had promised himself that he would save all his money for England and for the sightseeing, not clothes and makeup products he didn&apos;t need. "Are you done? We&apos;ve spent ages in here and we have to be back to meet that man in ten minutes," Jonghyun said, he feet aching from all the walking Key had made him do in only forty minutes. Sometimes, he wasn&apos;t sure how he even coped with Key&apos;s shopping obsession. "Yeah, yeah," Key said, pulling out his wallet and handing the cashier the correct amount of money. The cashier quicky bagged his item and handed Key change, smiling as the two boys walked back out of the shop. "It&apos;s that way, right?" Key said, pointing towards the escalator. 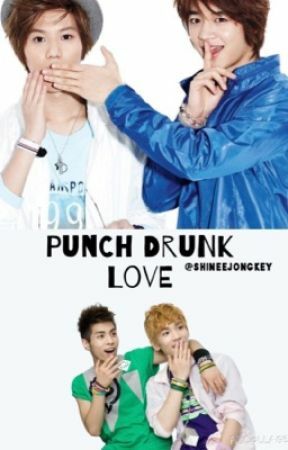 Jonghyun shook his head, dragging Key over to the bright sign that showed the times of the flights. "It&apos;s this way." And so the boys met up with the rest of the members and management and flew to London, successfully getting to sleep on the flight, despite the awkward tension between the five of them. What could England possible have in store for them?